The weather has been playing games for the last couple of weeks. Just when I think it's good to go out in a light jacket, the wind picks up or when I am all bundled up, it's nice and sunny in the afternoon. But when the weather forecast said snow, I balked. "NO MORE SNOW," I wanted to yell. But this first bloom I saw in the front yard cheered me up. 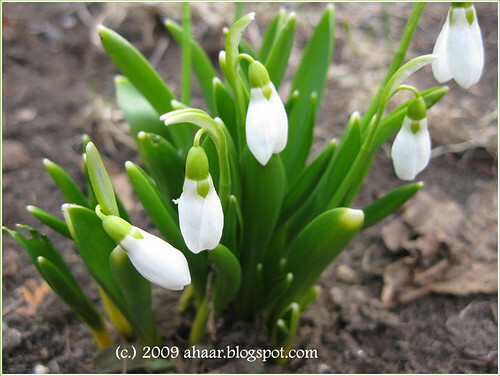 I know spring can't be that far away. This chicken salad is my defiance. 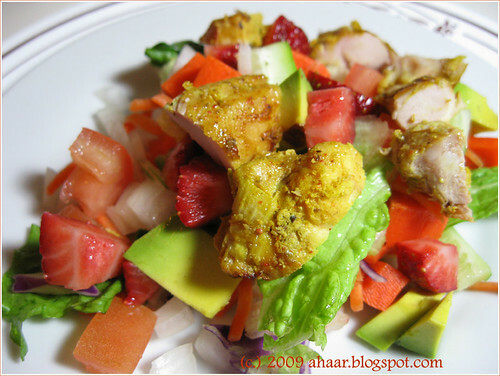 I call it "Almost spring chicken salad" with colorful vegetables like tender lettuce, strawberries thrown in together. 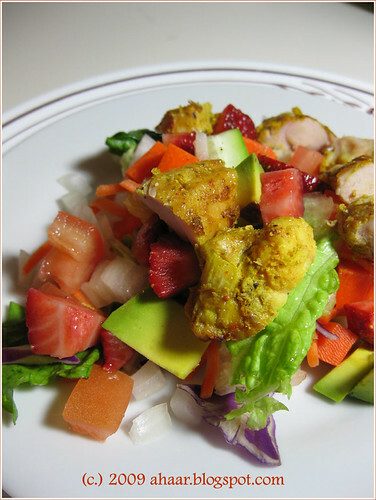 The dressing is lemon juice, sesame oil, cumin powder and it makes the salad fabulous. Marinate the chicken and keep it aside for an hour. In the meantime, pre-heat the oven to 350 deg F and then grill the chicken for about 8-10 min on each side depending on the oven. Take it out and let it cool to room temperature. Mix the rest of the ingredients together and put in the dressing an mix it well. Then add the chicken on top and serve. And this is my entry to Click:Wood hosted by Bee and Jai at Jugalbandi. 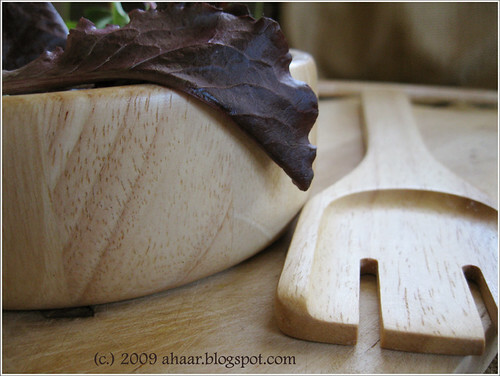 These are two of my favorite woodwork - salad bowl and my cutting board. Don't know what would I do without them! Even though I finished the week-long Eating Down Your Fridge challenge, I am still continuing to clear my fridge. This week, we bought a few vegetables, milk and fruit. For this chicken curry, I decided to use the chicken I got from Farmer's market and had stored it in the freezer ever since. I used a few pieces for this curry and the rest I grilled for a delicious chicken salad (recipe in the next post). I used whole garam masala for this curry. I put it in right at the very beginning and let it cook through the whole process. 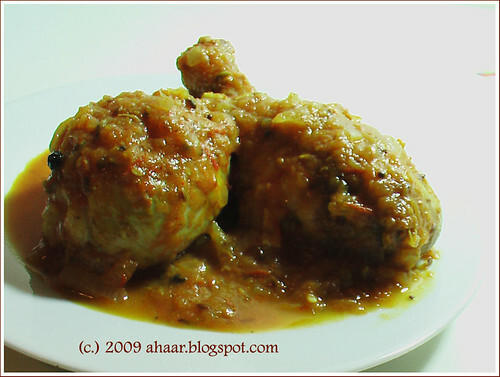 It gave a wonderful flavor to the chicken masala. 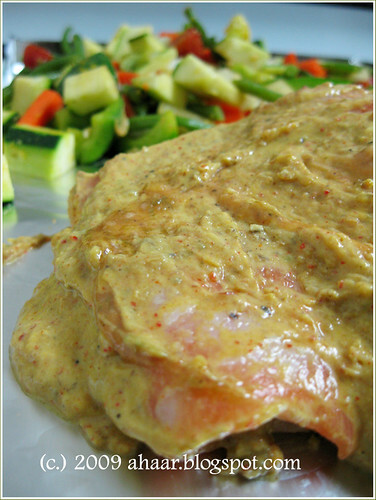 Rub the chicken with turmeric powder, chilli powder and salt and set it aside for 30-40 min. Heat oil in a thick bottomed non-stick pan and saute the chicken pieces on both sides for 2-3 minutes each. Temper the remaining oil with dry red chilli, cumin seeds, bay leaves and the whole garam masala. Once they have plumped up, add in the grated ginger and garlic and saute till it starts to give it's aroma. Then add in the onions. Let it cook til they've softened and start to turn brown. Then add in the tomato puree, chili powder, turmeric powder, coriander and cumin seed powder and let it cook til the water has almost evaporated and it is all mixed well together. Add in the chicken pieces and water and cook it on medium heat for 15-22 minutes till the chicken is cooked and there is a nice curry base. 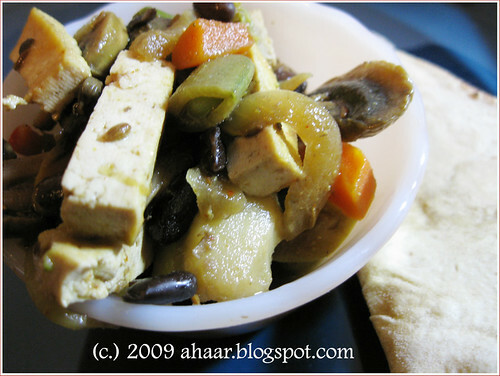 Serve warm with naan or rice. Eating Down the Fridge: Mission Accomplished! Eating down the fridge has been an interesting challenge! It forced us to find interesting and creative ways once we ran out of the usual options. And we discovered things in the fridge and pantry that I had forgotten about. I found bagels for brunch with delicious cheddar and onion omelet. Added to discovered list was bread that was promptly thrown away before it hurt anyone, but also turkey meat balls which made a delicious lunch. I finally used the methi sitting in the fridge to make methi matar malai and ended the week on a high note! The trying part in the challenge came when we started running dangerously low on milk on day 5 and ran out on day 6. We invited a friend to tea only to realize that we had no milk! We wavered for a bit, but decided to stick with it. As soon as I finish writing this post, we are going grocery shopping. Can't wait for some fresh greens for a salad. Now that the freezer is clearing up, I am discovering things I didn't know existed in the freezer. While pondering over dinner choices, I found a pack of frozen rotis we had bought more than a month ago to try, and then promptly forgot. You can imagine our surprise and pleasure at finding this, almost like we were on a treasure hunt! 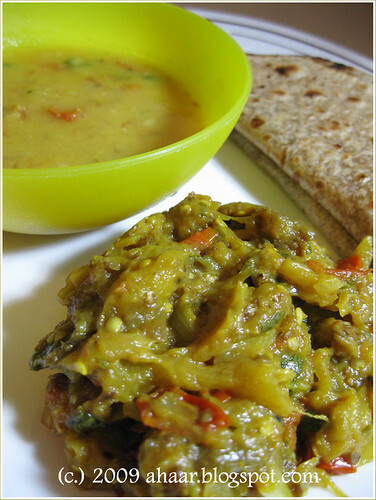 So the dinner was Baigan bharta (charred eggplant with spices) dal and rotis along with yogurt. Not bad for Day 4, wouldn't you say? But no pictures of our lunchbox today. We overslept and then hurried to get out of the door on time. Dinner: Dal, Baigan bharta, rotis and yogurt. We have a dinner invitation for tomorrow night that was planned before I knew we were participating in this Challenge. So no dinner to cook tomorrow night, but will continue it for Day 6 and Day 7. Day 3, we're half-way through Eating down the Fridge. Suddenly I am more aware of food items running out and looking at the stock in the fridge and pantry with fresh eyes. Several of you have commented that we are eating healthy and that is probably true. If we still had bread, I am sure we would have made sandwich with Trader Joe's masala burgers (which are always there is the freezer) and taken that for lunch a couple of days. But, that option is not there this week as we ran out of bread on Day 1. We have to come up with other options. And those options have been fun, and interesting so far! Plus, I haven't even mentioned the snacks I indulge in with my chai. What isn't fun was that I heard Chipotle in Ann Arbor was giving away free burritos today. It had to be this week! :( We didn't go there and to treat ourselves, we had a wonderful Moroccan inspired dinner. I marinated chicken breasts with Moroccan spices and made a couscous salad with fresh vegetables (leftover greens, cucumbers, tomatoes, leftover olives, and onions). It was fantastic! 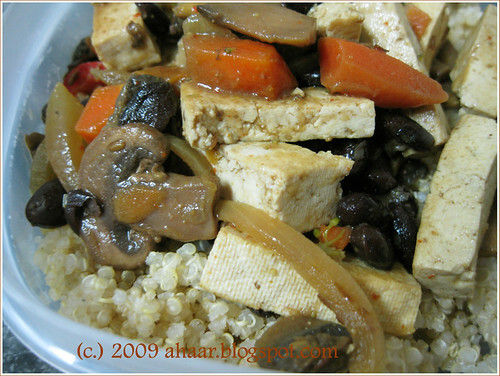 Lunch: Quinoa with leftover tofu, black beans curry. 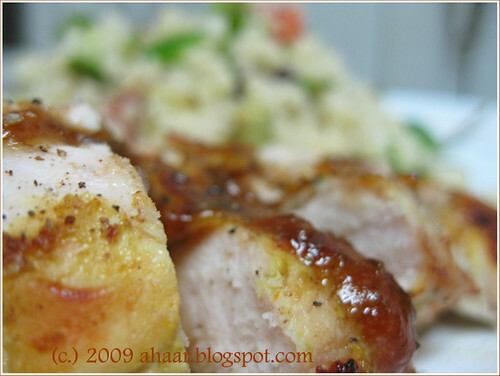 Dinner: Couscous salad with grilled chicken. So day 1 was easy. As many of you pointed out, we had delicious and healthy food through the day. Sure, there is some planning to do. I am learning that last night's diner makes great lunch dabba the next day. 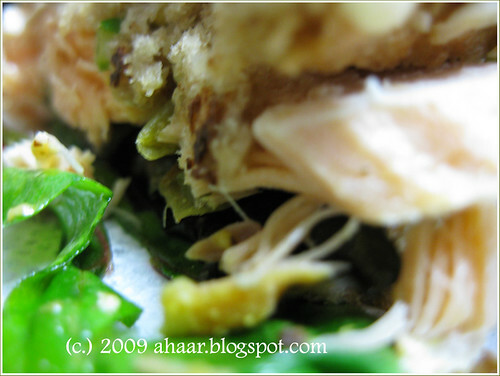 As I write this, I am planning tomorrow's lunch and I think I just came up with a great idea! Before I digress, let me tell you all about today. I got up again to pack food for the day. Lunch for Aswin: Leftover rice and avial. Snacks: Apple, grapes and roasted almonds. While web browsing I came across an announcement for Eating Down the Fridge Challenge. Till then I had not really thought about what or how many times we eat outside. The best way to find out, I think, is to try it out. So this week I am taking the one-week long challenge - Eating down the Fridge. I got up early despite losing and hour, and packed food to get us through the day. Don't forget to come back and see our menu for Day 2. You know how fond I am of doing a one pot meal during weeknights. When I came home last week on Thursday, I was in the mood for minimal cooking but lots of flavor and spices. As it was almost the end of the week, my choices were limited. 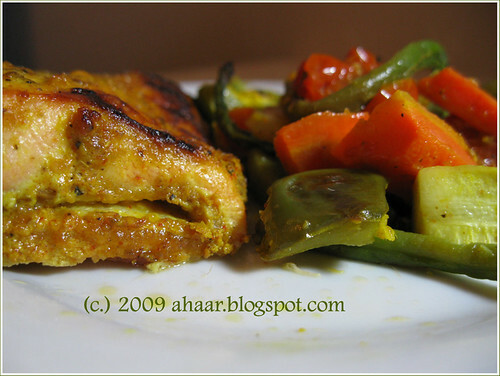 After some thought, I took out the salmon and decided to bake it tandoori style with some roast vegetables. Two hours later, I had some delicious dinner on the table! I have to confess, this was my first time baking fish with tandoori masala, and I had no idea if it was going to be a good fit. But you can look at the results. 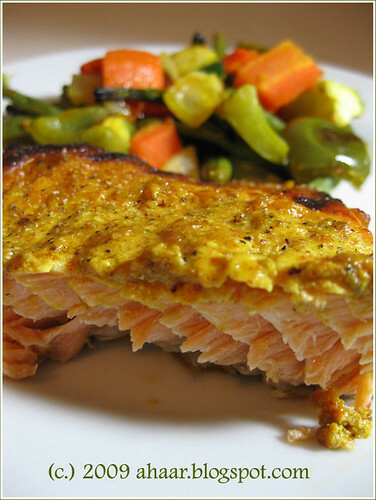 And the yogurt marinade, in my opinion, brought out the creaminess of the salmon which of course complimented the spices. Thaw the salmon. 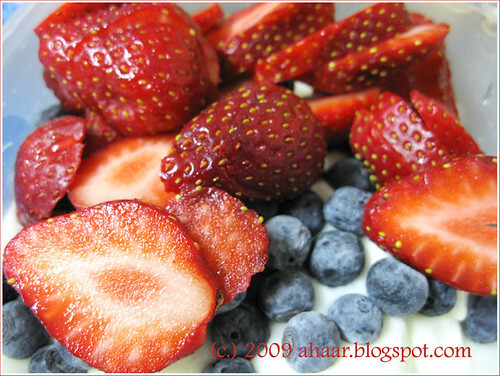 In a bowl mix the yogurt with the spices. Put it in a plastic bag, put in the fish, mix it together and let it marinade for an hour. Preheat the oven to 370 deg F. Place the salmon (and it my case, the salmon and the veggies) on a tray and bake it for 20-30 min till the fish is completely cooked. After baking it for 22 min, I put the heat to broil for last 3 min to get some of the browning you see in the picture. I have been picking up bunches of radish with greens esp from the Farmer's Market. I would use the radish different ways and throw away the greens. But when my parents were here over the summer, they were horrified that I would throw away the greens. "Eta diye bhalo saag hobe," (this will make delicious greens) my mom said as she rescued one such bunch. And yes, it was delicious with a touch of nuts at the very end! 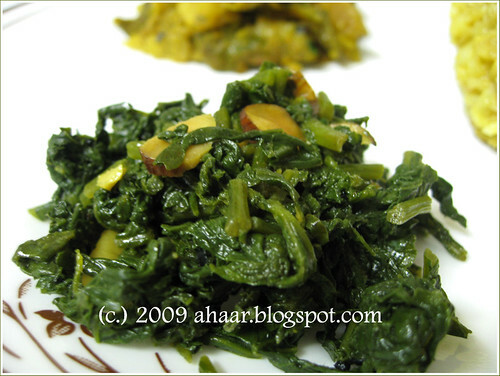 Since then, I always save these greens to make it into this simple dish. Temper the oil with kalo jeera, and red chilli. Then add in the radish greens, green chilli, and turmeric powder. Let it cook till it is almost done. Add the toasted almonds, let it cook for a couple of minutes and take it off the heat. 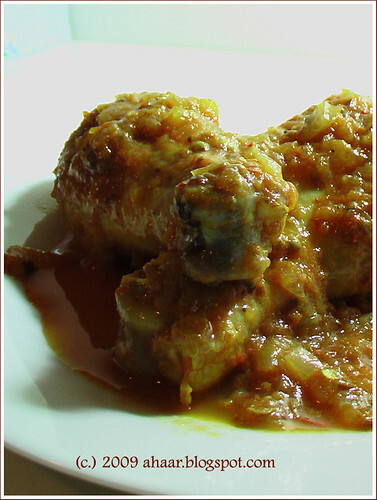 It is usually served as a first course in a Bengali household.